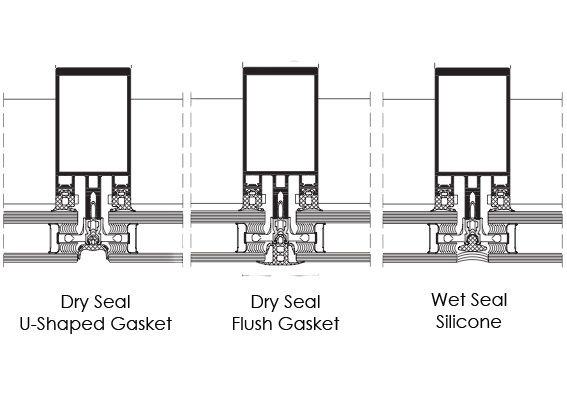 Option of dry gasket (U shape or flush fitted) or silicone wet-seal. 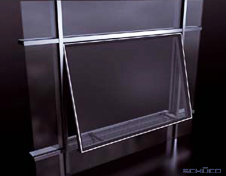 With structural glazing systems, a completely flush-fitted façade design is possible. An innovative generation of fittings with a particularly streamlined range enables the use of heavy vent weights - utilizing our zero sightline windows. For more security and comfort, there is a specially developed ratchet stay for projected tophung opening units, which secures the window at any opening angle for changing wind loads. Fabrication is streamlined by reducing the total number of individual parts to be processed and using similar parts. The systems are suitable for commercial and institutional applications, and custom curtain walls are available in a virtually limitless array of sizes and configurations.